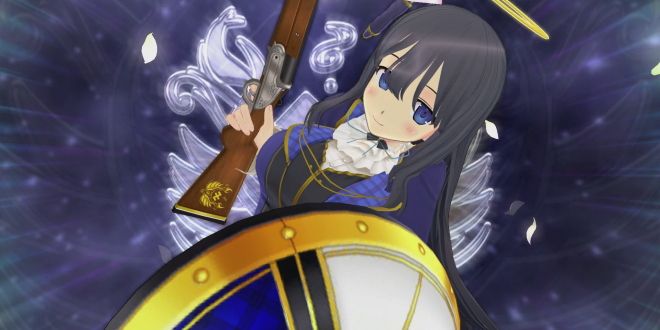 Senran Kagura: Estival Versus is the latest entry in the action brawler series. Senran Kagura is a fast-paced action game packed to the brim with ninja action, silly dialogue, and a whole lot of fan service. At first look, Estival Versus might look too silly to be enjoyable, but underneath the wild aesthetic is a solid action game, and it’s easily the most ambitious Senran Kagura title to date. If you’re looking for a great story, this really isn’t the game for you. 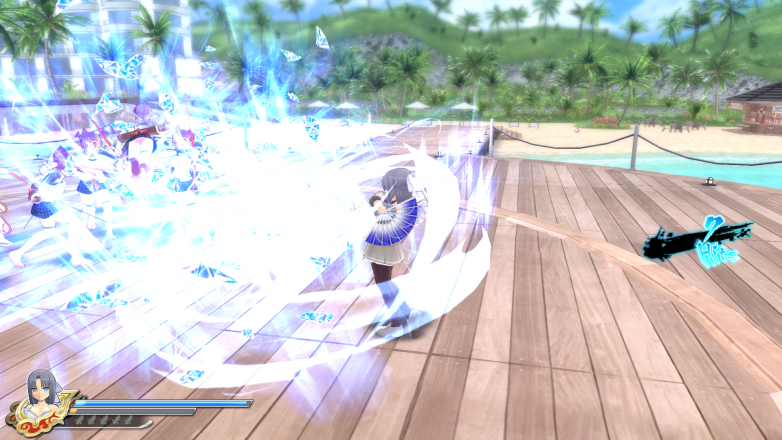 The girls in Estival Versus are transported to a bright tropical island after being surrounded by a bright light. To make things even weirder, characters that died in previous installments have mysteriously returned, and it’s up to the students of four rival shinobi schools to figure out the mysteries of this parallel dimension. They end up competing in a competition – the winning school will learn treasured shinobi secrets, and they’ll also be able to truly put the spirits of their newly resurrected friends to rest. The competition basically has the girls defeating hordes of enemies and trying to best each other in combat. If you’ve never played a Senran Kagura game before, you probably won’t understand much about the characters. The game gives you a very shallow overview of the characters, but those who have played the other games (particularly Senran Kagura: Shinovi Versus) will get much more out of the story. Even as someone who played and enjoyed Shinovi Versus, I found the story to be extremely light and often nonsensical. 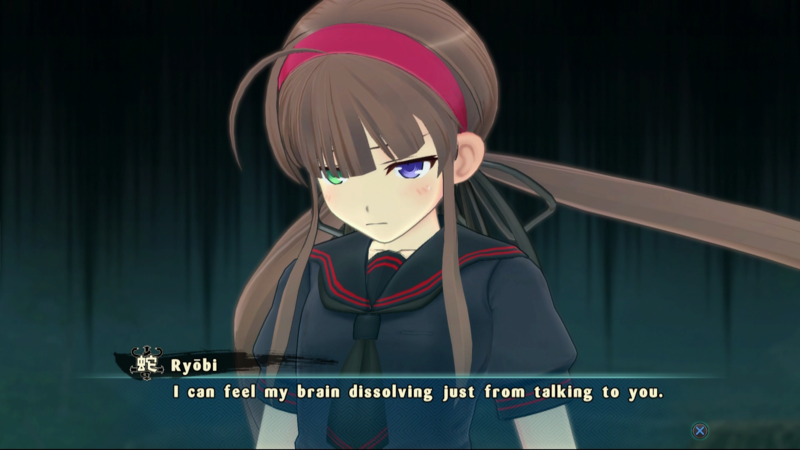 I never really expect deep stories from the Senran Kagura games, but I think that the unique set-up of Estival Versus could have given the series a reason to step up their game in terms of plot. Estival Versus has two major gameplay elements. Most of the time, you’ll either be fighting through action segments (in the form of missions) or reading through visual novel segments. The visual novel sections try to advance the lackluster story, and they can get sort of annoying. However, the game redeems itself with its action sequences. There are 34 playable characters in the game, and you’ll take control of one of them in each mission. Each shinobi has their own set of moves, and it makes playing each character feel worthwhile. Rather than being given characters that just look different and fight the same way, each of the characters in Estival Versus has abilities that look cool and are a lot of fun to pull off. There are a few moves in the game that are quite difficult to master, and it adds a lot of replay value to the game. If you want, you can just mash buttons and speed through the game, but if you really want to excel, you’ll have to take your time and learn the best way to use each shinobi’s skills. Replaying stages, building up high scores, and unlocking new outfits, movies, and images gives you an excuse to keep chopping through endless waves of enemies long after the credits roll. You also have the Kagura Millenium Festival story mode (the main story), the returning Shinobi Girl’s Heart mode (which tells unique stories for each of the girls), and a handful of special missions. You’re not only limited to hand-to-hand combat. You’re able to use elemental items called bombshells (pictured below) that can really help you get out of tough situations. Each character also has unique weapons that can be used. Generally speaking, they’re all equally effective against enemies, but it is nice to have some variety. In addition to your normal attacks, heavy attacks, combos, and bombshells, you can also utilize frantic mode and a shinobi transformation. Frantic mode drops your defense (as your character rips all of her clothes off), but dramatically raises your attack. 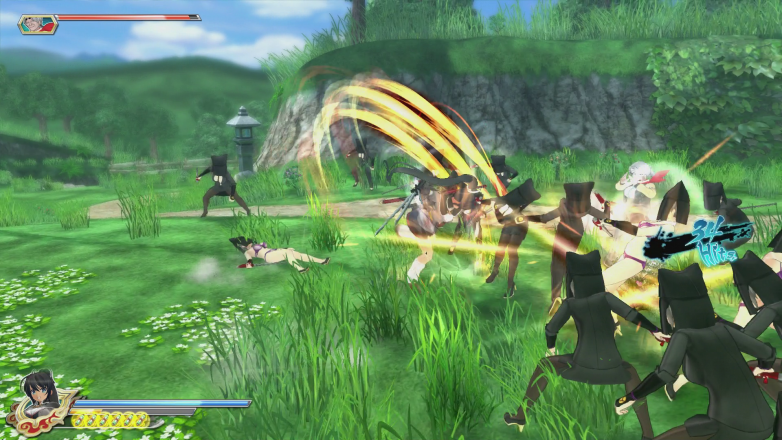 Shinobi transformation changes your outfit completely and unlocks a series of special attacks. You can either use your transformation immediately to gain access to strong attacks, or you can put it off until you’re up against a particularly tough enemy. You can also play around with the dressing room function, which is where the majority of the fan service takes place. Since it’s entirely optional, it doesn’t really distract players from the core game, which is where the majority of fan service becomes an issue. 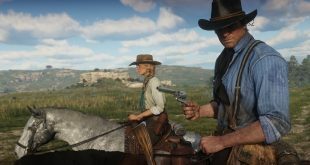 If you do choose to play around with the function, you have an insanely diverse amount of outfits to play with, and there’s also a lot of different poses, character combos, and backgrounds. It can be an entertaining distraction, but there’s not much there that really adds to the quality of the game. 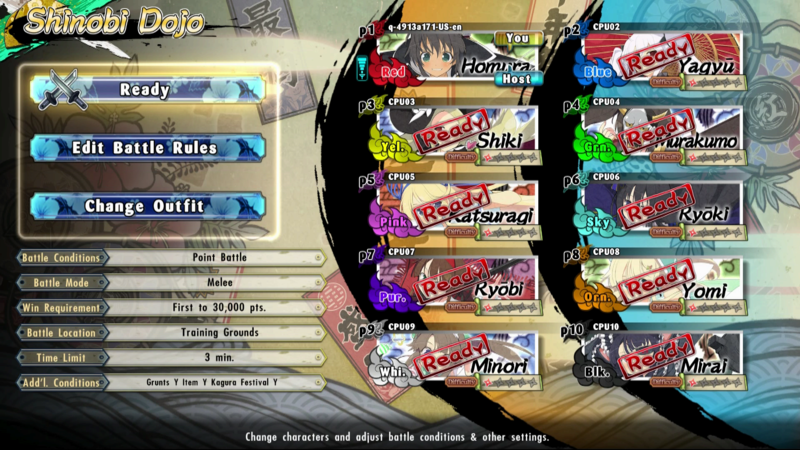 You can use the Shinobi Dojo function to take the action online. On PlayStation 4, up to ten players can play together, while the Vita version supports up to four players. 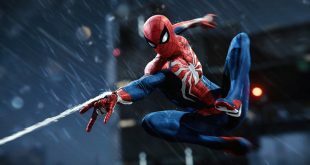 There are several free-for-all and team game modes to play, including a classic Deathmatch, a score attack mode, the brilliantly named “Capture the Bra,” and three others (Understorm, Shinobi Survival, and Walker Battle). I spent much more time playing the story modes than the online battles, but the online modes are definitely appreciated, and they work well. Overall, Estival Versus provides fun action gameplay that, while not revolutionary or incredibly impressive, is worth checking out for fans of the genre and of the series. Estival Versus is available on PlayStation Vita and PlayStation 4. Needless to say, the graphics are much more impressive on the PlayStation 4. However, I’ve always thought that the Senran Kagura franchise is most at home on portable platforms, and my opinion hasn’t changed with the launch of Estival Versus on PlayStation 4. The visuals on the PlayStation Vita are not bad by any means, but they don’t really push the boundaries of the platform. 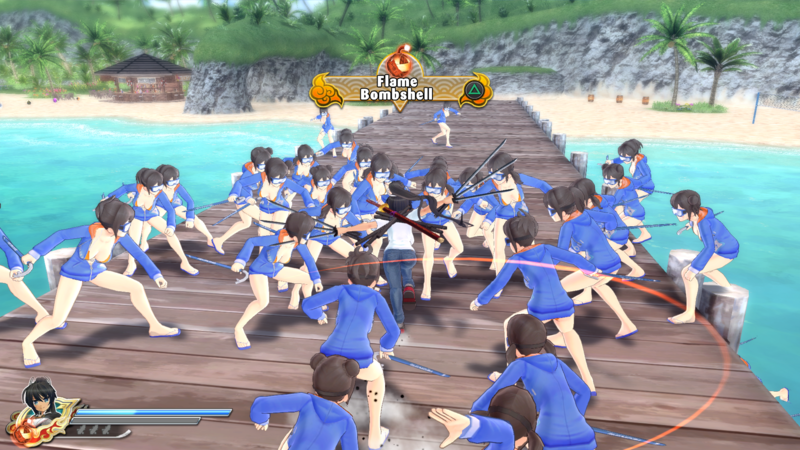 There are many games on the system that look just as good (and many that look better) than Estival Versus. This is also true with the PlayStation 4 version. It’s a good-looking game, though, and I didn’t really find much to complain about – besides the lack of variety in the enemy design. The soundtrack is a lot of fun. The tracks range from instrumentals that would feel at home in the lobby of a beach resort to intricate pieces that would fit in a ninja movie. The music fits the game very well, though you will hear the same tracks multiple times. However, it probably won’t be too noticeable since the score tends to get drowned out by the sound of fighting. If you didn’t like the Senran Kagura series before, there’s nothing about Estival Versus that’s going to change your mind. If you’re looking for a fun, fast, and somewhat silly action game, though, Estival Versus will probably scratch that itch for you. There are those who are going to be immediately turned off by the character design, and that’s just fine. 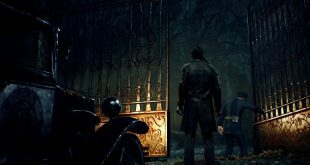 Some gamers will also be turned away by the repetitive nature of brawler style games. But if you’re willing to give it a try, you’ll find a solid fighting game that’ll keep you occupied for quite some time to come. Estival Versus is packed to the brim with fan service, but there's a solid fighting mechanic underneath that makes the game worth checking out (if you can handle the aesthetics).